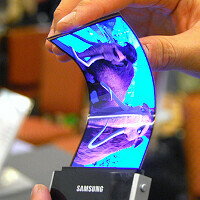 5.99 inch AMOLED flexible display coming with the Samsung Galaxy Note 3? Last month, we told you that Samsung was looking at three different versions of the upcoming Samsung Galaxy Note 3 and one of those units was equipped with a flexible screen. Despite previous denials by the Korean OEM, speculation out of South Korea has Samsung using a 5.99 inch flexible AMOLED display on the next iteration of its phablet. Other rumors have Samsung using both AMOLED and LCD panels with the one used on each unit depending on the market it is offered in. A published report on Friday says that the Samsung Galaxy Note 3 with a flexible display will start production in August and launch in September, possibly during the IFA 2013 show in Berlin. According to the report, Samsung decided to go with the flexible display for the Samsung Galaxy Note III after demand started fading for the Samsung Galaxy S4. After sales of the handset got off to a great start with 10 million units purchased in the first month, demand for the flagship Android model has apparently dried up. Additionally, reports that LG is close to releasing a phone with a flexible display might have given Samsung the incentive to use a flexible panel for the next generation of its phablet. if samsung manages to keep the size under 6 inch with thin bezels, i think they will take over the phablet market once again. they never lost that market. there hasn't been any serious competitor. "i think they will take over the phablet market once again." There are no other phablets for sale at least in the US. Only the Sony Xperia Z Ultra 6.4" would come close but Sony still hasn't figured out how to release product on all the carriers at the same time. That's why I don't take them seriously. The threat would have to come from HTC or Motorola. But for the 5" and below phones Samsung is not as powerful as before because there are many more Android alternatives to choose from. As a Note 2 owner I'm not rooting just for just Samsung; I'm rooting for Android. I want there to be more selection and I want HTC, LG, Sony and Motorola to step it up. Apple has given up trying to battle feature for feature and I have no respect for another "S" model. LG Optimus Vu is one of the worst handsets ive ever seen. The stylus doesn't even attach to the phone. Since Sony will not be able to sell on different carriers, it may be carriers fault, but it IS a problem for Sony. They never lost that market and they will never loose. Note 3 will be a kick a$$ device just wait and watch. But I do wanna see thin bezels though. A thin bezel is the current trend for all the flagship devices (S4, the upcoming iPad 5, iPhone 5S/6, etc) and it'll just keep getting thinner until there's a barely perceptible bezel around the screen. Depending on how thin of a bezel Sammy equips the Note III with, it MIGHT be possible to have the Note III fit within the footprint of the Note II. One thing is for sure though, the Note III is getting the PR churn treatment. Which drives interest in the new release. Other companies are now just jumping into phablet market. Note series created it and still owns it. there is nothing to take over they are on top of that market they stated it . and a 6 inch is just to big ill bet its going to be a 5.7 inch but maybe im wrong . I wouldn't think they'd use that for the Note III but maybe for a new Galaxy/Note category. The Note is it's own thing now and switching to a flexible display would be a big change for that line of phones. why don't you guys just round that figure to 6"? for marketing purposes. people think 6 is too big while 5.99 does is usually associated with 5. the same thing retailers do with their prices. Maybe I'm missing the point here but I don't care about a flexible screen! Either give me a brighter Super Amoled Plus that I can see in direct sunlight, or go LCD3. But this flexible screen thing isn't looking very desirable. maybe you should buy the GS4, you can easily see the screen in sunlight with auto brightness on. Not to be taken as criticism, but what's the point of these flexible displays? THANK YOU! I for one, have know flippin' idea. It looks like a punctured screen just waiting to happen. They are supposed to be more durable. They wont crack or shatter as easy. They arent going to fold in half or anything crazy like that. Plus they are lighter and slimmer then glass. so what happens to scratch resistance now? if they will still use glass, it will still break and cost some amount to repair. if they use plastic, i don't really think there's any scratch resistance to talk about. I believe they are made of plastic, not glass. i think the most samsung can do to make use of the flexibility is to make the note 3 with a display that extends to the side or a display that wraps around the device. there's no significant demonstration of flexibility because everything will be fixed. glass will still be used to cover the device. once the glass breaks, you will still experience the shatter. Durability. More resistant to cracking from drops.